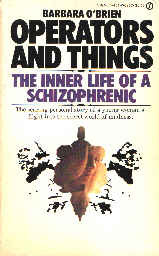 The subtitle of this small paperback is "The Inner Life of a Schizophrenic," and it describes best the theme of the book. "Operators" we find is O'Brien's name for beings that live inside her head as part of her unconscious processes, which for her are made conscious during her insanity. The name "operator" is given by an "operator" to itself to distinguish itself from a "thing." A "thing" is the normally conscious part of a person that is maneuvered, out of its awareness, by an operator. Thus "operators and things" refer to the complete set of unconscious and conscious processes laid bare for us by a "crazy" person who became privy to the workings of both aspects of her mind during a trip into insanity and back into sanity. The trip to sanity was on a Greyhound bus - a mode of transportation chosen by her operator Hinton as the safest method of living in the sane world as a schizophrenic. One can travel on a bus, ignoring fellow passengers, being in a daze, acting slightly odd and be completely unbothered by fellow passengers. Her trip takes her to San Francisco after a stop at a mountain cabin and a close encounter with Indians and a mountain lion. She retreats to an apartment building in which her solitude is invaded by beings who invade her mind from neighboring apartments - Grandma who gives her medical advice and the Western Boys who "scallop her latticework" and leave her "dummetized." A glossary of terms is dictated to her by an "Operator" and is included in the appendix for the reader who gets lost in the world of fantasy she spins with her words. Out of the fantasy she emerges - sane - six months later - with new processes, aggressive traits, and abilities for coping in the business world that she never had before. In addition she adds to the store of literature on schizophrenia a rare, first-person account of a trip so many people take but so few return from. A glimpse of an inner life we all live but keep safely hidden under our veneer of sanity.